Horses want new experiences just like we do and horse owners want good rides. Horse owners throughout the country know that mental and physical stimulation is an essential to a horse’s well-being and are always looking for somewhere new to ride. 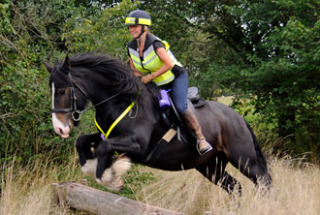 For riders in the East of England, we offer a selection of good rides chosen by Petra, a keen ViewRanger and member of the Essex Bridleway Association (EBA). Petra often uses ViewRanger to record her favourite treks to share them with other riders. We have picked just a few of Petra’s most popular routes, but if you would like to see more have a look at her ViewRanger profile. Horses are like big kids at heart and love to play, so a gallop down the beach is high on their favourites list. Some horses are a little apprehensive of the waves at first; others jump straight in and sometimes even go for a swim! It is 5 miles from Courtyard Farm to the beach and the ride is of medium difficulty. If you fancy a go at the beach this route is free to download to your smart phone. Riding in a forest is a great way to feel surrounded by wildlife. From birds and rabbits to squirrels and deer, you could see it all. 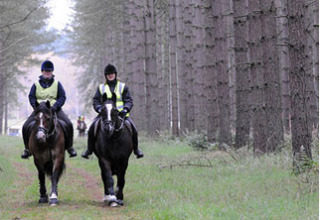 Thetford Forest is perfect for riding as there are grass paths between all the trees. Petra’s Thetford Forest walk is an 8 mile circular route of medium difficulty. At the start of the route there is a free public car park with plenty of room for trailers. As with any outdoor activity, (4 legged or 2) sometimes a rest is required! The Wheathampsted route is a perfect example of this with the John Bunyan pub located roughly half way around this route. The pub welcomes all party sizes and provides food and drink to keep you going! The route itself is 13 miles and is rated an easy ride. The route also has spectacular views of Nomansland common. This route is one of the EBA’s annual events and passes through the North Thorndon Country Park. The area is home to a 15th Century deer park, as well as ancient woodland, grassland and 3 small lakes. This route is an 11 miles circular track and has been rated medium in difficulty. Parking is available at the start of the route, however £2.20 is payable for a horsebox/trailer. We hope we have inspired you to use ViewRanger and try out some new routes. If you have any routes in your area, please upload them onto ViewRanger and let others share your enjoyment! Finally, remember, if you are out on a ride safety is paramount. You will undoubtedly have your mobile with you, so why not download ViewRanger to track your route. That way you will always know where you are; ensuring you and your horse can concentrate on enjoying yourselves! Photos kindly provided by the Essex Bridleway Association.